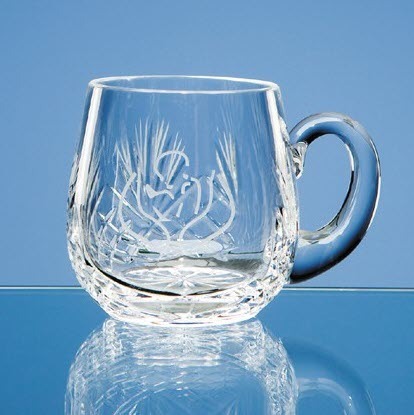 Personalised and Engraved Mini Lead Crystal Tankard. Ideal as a christening or birth gift that can be engraved with the babies name, date, weight etc. It can be personalised with any crest, logo or wording to create a gift that is sure to take pride of place when put on display at home or at work. You can have up to 4 lines of text. If you require an image too then you can have 3 lines of text. If you require more than this please contact us first before placing your order. We have a standard assortment of images should you require one or alternatively you can just have text. If you choose to have your own image/logo there is a one off set up fee of £15. This is payable only once, this isn't a charge per item. Please upload your image below.